Breakfast is easily my favourite meal of all, not just because it arrives so sweetly after a rude awakening, but because, in Brisbane, absolutely everything is fair game for breakfast. Whatever the time, temperature, appetite, or location, breakfast won't discriminate, or judge your morning face. We've rounded up some of the best breakfasts in Brisbane you've probably never tried, and suggest you get adventurous. Let's kick things off with a delicious bircher. Cantina 817's has been soaking in orange juice to save you the choice when you're ordering drinks, and they'll dress it up with dried fruit, fresh berries, nuts, and yoghurt, just to keep things fresh. Oh and it's made from uncontaminated oats. Coeliacs, assemble! Paddington favourites and slayers of convention, Shouk Cafe's breakfast menu is a straight up rebel. 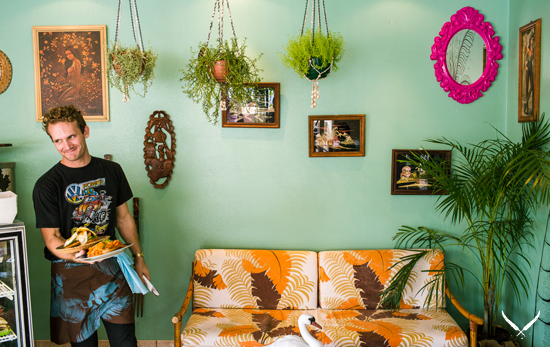 It's no surprise these guys are hot contenders for the best breakfast in Brisbane. Leading the way is the date panna cotta, made on goat's milk, served with pistachio, seasonal fruit and a nest of kataifi pastry. Dessert for breakfast? Take that, rulebook. You need to experience the wonder that is the toasted waffles with strawberries, praline ice cream, and sugared almonds from Lurleen's at Sirromet Winery. One of the best Brisbane breakfasts you've never tried, you need to get here. Tucked away in residential Kedron, Nana & Da's is the local's favourite, and one of the best cafes in Brisbane. With a strong focus on fresh, high quality fare, you're always guaranteed a top-notch meal. 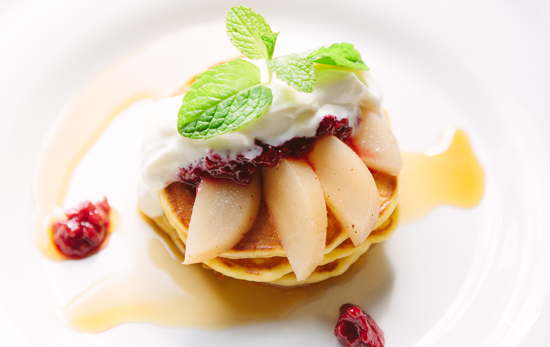 Nana and Da's coconut pancakes with grilled peaches, topped with maple and Maleny yoghurt is a must-try Brisbane breakfast. In its previous life Form7even was popular local haunt Café Urbano, but they have since expanded into the shop next door and taken everything to a whole new level. With an extensive menu offering breakfast, lunch, dinner and dessert, you'll be spoilt for choice. Form 7even's macerated peaches and blueberries on cinnamon dusted French toast, with manuka honeyed mascarpone, really hits the spot! Brisbane café, Merriweather's latest breakfast addition is so new it just missed out on our crumpet shortlist (linky). Their house-made sourdough crumpets come served with spiced fruit compote and roasted macadamia honey ice cream, because they have absolutely no mercy for my waistline. Breakfast burritos need not be a last minute resurgence of last night's leftovers. The chaps at West End Coffee House have turned pulled pork and beans at breakfast into an art, snuggly wrapped up with fried eggs, avocado, cheese, coriander, and chipotle sour cream — one of best Brisbane breakfasts you've never heard of. You can now forego your guilty McMuffin habit in favour of one of Ben's Burgers' breakfast items. These newcomers to the Brisbane restaurant scene have concocted a sausage, egg and cheese breakfast burger, topped with bourbon barbecue sauce — Macca's has nothing on this clown. Egg sarnies not your thing? Prefer a bagel of succulent deliciousness sans chicken product? How fortunate Hoo Ha Bar is here to save you with their premium breakfast bagel stuffed with sopressa, swiss cheese, chilli jam, and caramelised onion. The latest from U & I Espresso is a New York style bagel dubbed the 'Marilyn', and rightly so. Beneath a toasty crust is a skirt-raising combination of ricotta, smoked salmon, basil, tomato, and capers. From the fridge of Dr. Doolittle. Spice up your mornings at Pear Cafe with a plate of their Moroccan spiced poached eggs. They won't skimp on the house-made hommus and they'll throw in caramelised onions, mint, feta, and grilled limes, all served on toasted sourdough. Plant your face into a plate of roast pumpkin fritters at Samson and Sophie. Served with fresh greens, honey carrots, Bahbah's yoghurt cheese, and a poached egg, this is an unconventional taste delight and the perfect way to get you pumped in the early morning. One day, I promise I'll devote an entire article to the glory of breakfast peas. In the meantime, chow the minted peas at Shucked Coffee House. This delightful breakfast addition comes with beetroot relish, a soft boiled eggs and goats curd, on trusty sourdough, of course. Don't be put off by green vegetables at breakfast guys, give peas a chance. Give your insides a good cleanin' with the Low Road Cafe's breakfast salad. Before you recoil, envision lemony halloumi, a dukkah egg, shaved zucchini, roast mushrooms, red onion, and fresh herbs with a yoghurt dressing on sourdough. This kind of salad is the harbinger of good times. I'm always on the lookout for new and exiting ways to incorporate halloumi into every part of my diet, and the Rare Pear's halloumi and sweet potato fritters are the perfect shake-up. This epic Brisbane breakfast includes grilled chorizo, sautéed artichoke, spinach and cherry tomatoes with two poached eggs, this is one veggie chow plate that won't disappoint. More halloumi fritters! This time, for the Westsiders. Served with seared cherry tomatoes and sweet corn cream on grilled sourdough, Famished on Frasers badass fritters are fast becoming a Sunday staple. Pancakes aren't just for maple and strawberries, swing by the Ponycat for a scrummy stack of their savoury pancakes made with sweet potato and leek and served with smoked salmon. Mainstays at the breakfast table of our British cousins, beans have a habit of falling in and out of fashion… thank God they're cool again, I say, and one of Brisbane best cafes, the Gunshop Café, is helping to re-blaze the trail. Their house Spanish baked beans come with the bounty of fixings; ham hock, pork belly, baby peppers, rainbow chard, tomato sugo, fried egg, and cheddar cheese toast. Mmm, cheese toast. The choice between beans or avocado on toast is a dilemma no more. 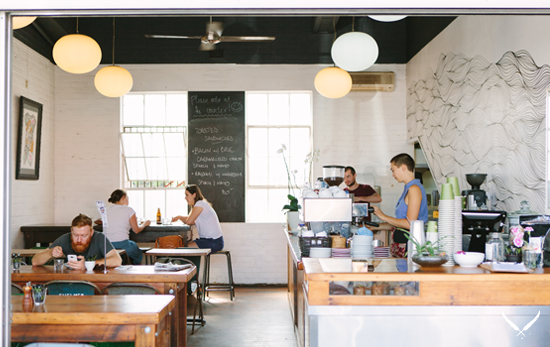 Thanks to the quiet genius of new Brisbane café Mickle Pickle Espresso's beans AND avo on toast, you can satisfy your every breakfast whim in one bite. This toasty dish is also finished off with a fried egg for that valuable protein. If you're like most Brisbaners you're probably flat out working your way around our best American restaurants by night, which leaves your mornings pretty empty and distinctly lacking in soul. Make sure you carve out some time to dig The Dirty South's Boston beans, amped up with charred corn, mushrooms, eggs, corn bread, and a rustic potato fetta hash. Click here for more of the best breakfasts in Brisbane!